It’s a great question, so I wanted to address the topic of early planting a bit, well, “earlier” than usual! The first thing to keep in mind is that cold temperatures at or before planting can negatively affect the growing point of the plant. For corn, that growing point stays under the soil surface until the V5-V6 stage, helping protect the plant to a certain degree from colder weather spells for several weeks. For soybeans, however, the growing point comes out of the ground at emergence. Therefore, a soybean seedling is immediately vulnerable to cold weather. 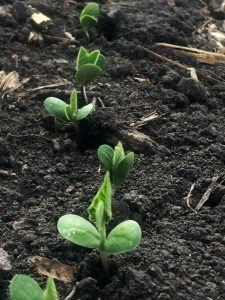 Using a fungicide seed treatment will help protect young soybeans from seedling diseases at this early stage, but they are not designed to protect against cold temperatures. Soybeans typically require over 100 growing degree units (GDU’s) to accumulate before emergence, which is similar to corn that requires about 125 GDU’s. Abiding by the minimum soil temperature of 50 degrees Fahrenheit will keep you away from poor emergence and the seedling disease risk associated with soil temps below 50 degrees. That’s why I suggest watching the weather forecasts before you plant soybean seed, and do your best to ensure hard frosts (which take place at 28 degrees Fahrenheit) are no longer possible. Remember, when soybeans emerge, they have a growing point at the base of each cotyledon and at the main shoot. The main shoot is the small leaves in-between the cotyledons. If you notice brown on the stem below the cotyledons, the plant will not recover. Early planting is proven to provide higher yields, but it is is fine balance between the two, so watch weather forecasts and soil temperatures so you can find the balance on your own farm. Grab a clump of soil and watch how easily it crumbles. If it stays in a ball, conditions are NOT right for planting. If it crumbles easily, the soil is fit for planting. Make sure your planting date is covered in your farm insurance policy – this includes your “do not plant before” dates. If you plant outside those dates, your insurance could be jeopardized.